Ten months after the behavior was first spotlighted, Google continues to charge its advertisers for "free clicks," thanks to a partnership that sees its ads served onto a well-known example of online pop-up-ware. According to new research from Harvard professor and noted Google critic Ben Edelman, the web giant is still sending ads to WhenU, a piece of pop-up-ware along the lines of Gator or Zango. As Edelman has demonstrated on multiple occasions, this can result in situations in which Google is essentially charging sites for traffic they're already getting. 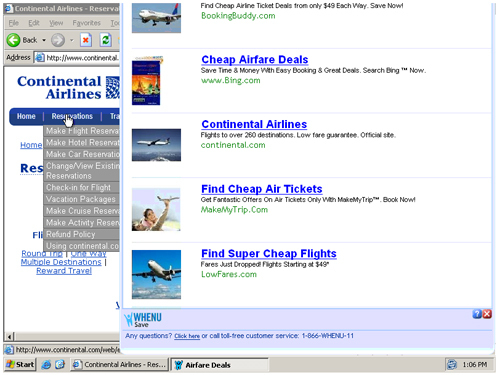 Using a PC loaded with WhenU, Edelman recently visited the website run by Continental Airlines. As the site loaded, WhenU filled his display with Google ads, including one for the Continental Airlines website. "Thus, Google charges Continental a fee to access a user already at Continental's site," Edelman writes in his blog post. "That's a rotten deal for Continental: For one, an advertiser should not have to pay to reach a user already at its site. Furthermore, advertisers paying high Google prices deserve high-quality ad placements, not spyware popups." Edelman calls it "conversion inflation syndication fraud." He first exposed this less-than-ideal Google ad behavior at a conference in February 2009, before outing another example with a blog post in May of last year. Google is aware of the situation - senior trademark counsel Rose Hagan was in the audience for Edelman's February presentation - and according to Edelman, it has given at least one company a refund after selling it free clicks. But he also says that others have been denied refunds, and though Google has not responded to our latest request for comment on the matter, it would appear the company has no intention of severing its connection to WhenU. After all, this behavior dates back nearly a year. According to Edelman's packet logs, Google does not have a direct relationship with WhenU. In the Continental Airlines example, traffic passes from Google to InfoSpace to LocalPages to NamiMedia and then on to WhenU. And with previous research, Edelman has recorded similar traffic chains. In May, for instance, he showed WhenU filling his screen with Google ads for the US cable outfit RCN when he visited the RCN site. In each case, the Mountain View web giant connects to WhenU through InfoSpace, and Edelman has called on Google to sever its relationship with the so-called meta-search provider. "Google's first step is easy: Fire InfoSpace," Edelman says. "Google doesn't need InfoSpace, and there's zero reason for this relationship to continue in light of InfoSpace's repeated failings." He also calls on the web giant to pay restitution to any affected advertisers - and amend its AdWords terms and conditions so that such refunds are guaranteed. "Every time Google charges an advertiser for a click that comes from InfoSpace, Google relies on InfoSpace's promise that the click was legitimate, genuine, and lawfully obtained. But there is ample reason to doubt these promises," he continues. "Google should refund advertisers for corresponding charges - for all InfoSpace traffic if Google cannot reliably determine which InfoSpace traffic is legitimate. These refunds should apply immediately and across-the-board - not just to advertisers who know how to complain or who manage to assemble exceptional documentation of the infraction." Edelman tells The Reg that last year, an RCN representative told him that Google provided the company with a credit after Edelman's May 2009 blog post. But he says that other unnamed companies have told him that Google denied them refunds. Edelman declined to name the companies that were denied refunds, indicating they did not want the publicity. RCN has yet to respond to our request for comment. It's unclear how often Google sells such free clicks. But the behavior is another indication that the company is willing to compromise the alleged efficiency of its online ad platforms in search of that extra dollar. With his May 2009 blog post, Edelman discussed several other situations where Google is in essence charging sites for redundant traffic, including the most famous example: Mountain View turning a blind eye to typosquatting. But ten months later, Google has yet to change any of the behavior Edelman spotlighted.